The ideal solution in relation to degassers for multi-family properties, industrial plants or district heating installations.. Provides complete degassing solutions to ensure permanent system efficiency, a degassing system for heating and cooling systems, heat pumps and geothermal probes. Why install the Spirovent Superior degasser? A system can only work at maximum efficiency when air in the system is reduced to a minimum. If insufficient air is removed from the water in the system, a number of annoying issues and noises will have to be dealt with, including maintenance work to remove the excess air, which can reduce the efficiency of the pump. The result: higher energy consumption and faults in the entire system, which often require costly repairs. 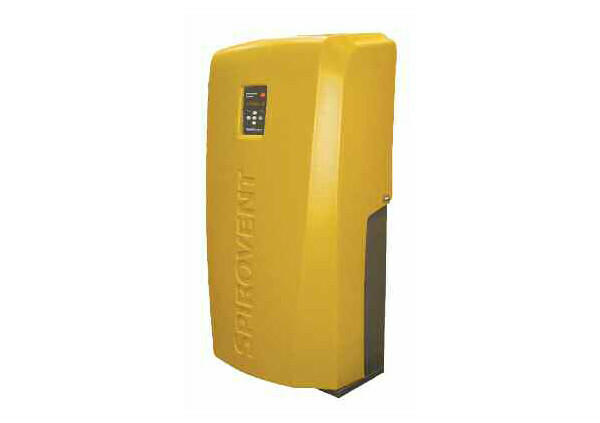 These consequences can be avoided by using SPIROVENT degassers. Degassing systems that can also be used in small or medium-sized single-family homes. They prevent the formation of rust and blockages in the heating system. Only the DS degasser maintains a water oxygen content below 15 ml/l. Keeping the oxygen content below this value prevents corrosion, blockages and the damage they can cause to heating systems. Ensuring the water in your system remains of the best quality not only guarantees a longer working life for the system, it also ensures optimum heat transfer, resulting in energy savings of up to 15%! Specifications for degassers SPIROVENT Superior.